It’s been 20 years since the Environmental Change and Security Program was founded to shed light on the new security issues of our times, so in honor of this anniversary, we’ve rounded up the 20 most popular stories of all time. 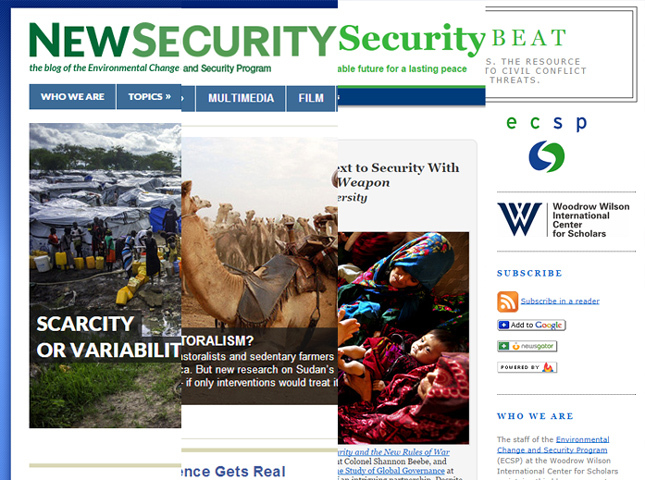 New Security Beat was launched in January 2007. From “trips to the nano frontier” to wondering if climate change will make tequila and lattes more expensive, a lot has changed since our early days on Blogger. But much has also stayed the same. We’re still taking a deeper look at popular but poorly understood narratives, like climate refugees, water wars, and population growth, and we’re still working to bring together diverse audiences that have more in common than they might think. In almost eight years, we’ve reached more than half a million people from every corner of the world and posted more than 2,000 articles. Best of all, we’ve had the honor of hosting some fantastic guest contributions from a network that keeps on growing. From demographer Richard Cincotta’s timely analysis of Tunisia’s chances for democracy as the Arab Spring was unfolding, to Dhanasree Jayaram’s plea for India to take environmental security more seriously after the devastating Uttarakhand flooding, some of the most popular posts are great examples of these collaborations. Here’s to 20 more years of discussion, partnership, and progress. Join us tomorrow for a panel with past and current ECSP directors, moderated by Andrew Revkin, and join the discussion by subscribing to ECSP News or following New Security Beat on Twitter, Facebook, or through RSS.